The Institute of Supply Management (ISM) has now released the November Non-Manufacturing Purchasing Managers' Index (PMI), also known as the ISM Services PMI. The headline Composite Index is at 60.7 percent, up 0.4 from 60.3 last month. Today's number came in above the Investing.com forecast of 59.2 percent. 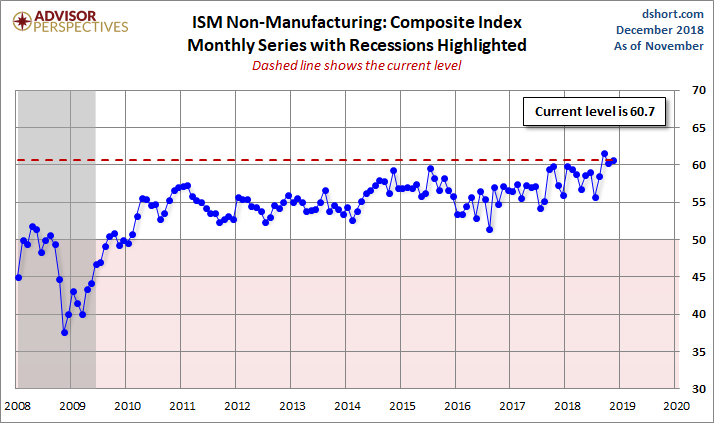 Unlike its much older kin, the ISM Manufacturing Series, there is relatively little history for ISM's Non-Manufacturing data, especially for the headline Composite Index, which dates from 2008. The chart below shows the Non-Manufacturing Composite. We have only a single recession to gauge is behavior as a business cycle indicator. The more interesting and useful subcomponent is the Non-Manufacturing Business Activity Index. The latest data point at 65.2 percent is up 2.7 from a seasonally adjusted 62.5 the previous month.